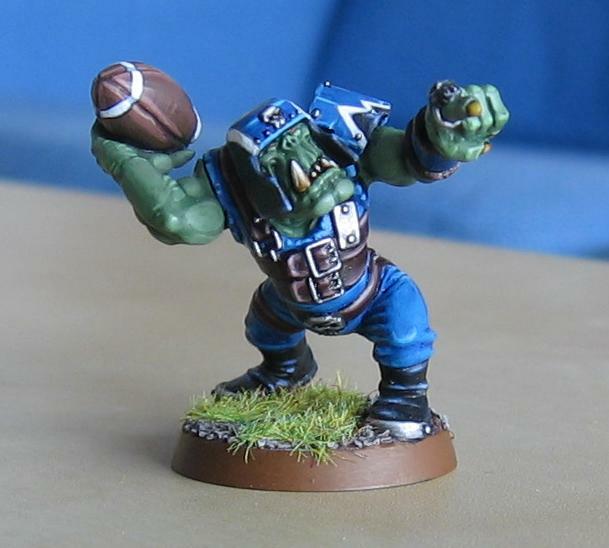 Blood Bowl Orcs – Who needs subtlety? For the second week in a row our popular Wednesday Night Gaming slot resounded to the cheers and jeers of Blood Bowl. We only managed to get in one half’s play due to spending an hour bashing the new Wardex for 40k despite the fact that none of us have seen it yet. Good times! Once again it was left to Servitob and I to throw down and with the flip of a cardboard token I ended up with the Orcs again, although, in a change from last week, I’d also be kicking off. We used the teams that came with the starter set and at the end of the half Servitob was left with a dugout full of knocked out linemen and blitzers while I had a knocked out thrower, a sent off for fouling Black Orc and a touchdown. After having spent two weeks now playing with the Orcs I thought I’d offer my insights into the team. If we do get around to running a league the Orcs are what we will see Servitob fielding. In general the Orc lineup isn’t the fastest nor the most agile, however, they have an average strength and above average armour. When you can set up overlapping tackle zones and block assists then they become really good. Normally Orcs work because they are cheap and you get more of them than your enemy does of his own troops, unfortunately this doesn’t carry over to Blood Bowl as each team can have a max of 11 players on the field at any one time. What will keep you going is that armour, having an average of AV8 across the team means that it will take a roll of 9 or more to get an injury roll and as any of you know, that is greater than the average. In two games I have only had one Lineman get knocked to the dugout through injury and only one Stunned Orc beyond that. In contrast I can almost guarantee at least one stunned result when I block or foul the Humans (my dice seem less cursed too) which takes them out of the game for at least two turns. You’re not that fast as Orcs although Blitzers are good ball carriers, they have a MA of 6 so are your fastest players and the addition of the Block skill also makes them tough to knock down. If you can get the ball in their hands them can stomp up the field (this is what got me my touchdown last night). In fact, in a league or self-created team you can take up to 4 Blitzers and these would be the first things that I include in a team. They are the most expensive players outside of Trolls and are the same price as Black Orcs. While the Blorcs have better Strength they are slower and have no Skills to start with. While Black Orcs are more likely to hurt their opponent the fact you are missing the Block skill means that you have to settle for push backs when you could get knockdowns and I find this really limits their usefulness when put against the Blitzers. Sure you are pretty much guaranteed to be getting two dice and picking the one you want even on defensive blocks but most teams will just try to dodge out the way and ignore his tackle zone. With a lowly MA of 4 he’s not going to be running players down either. Ideally they’d need some skills before becoming useful at all hence why I’d be more likely going for Blitzers. Linemen are obviously the bread and butter of any team. They have an average stat line with decent armour, they are best used in pairs to assist blocks against the opponent or as rush protection for a ball carrier. Even if they do get knocked down their AV8 should save them from getting injured more often than not. They are cheap too and will fill out a list after you’ve taken the various positional players you want to start your team with to get the tasty skill rolls. Orc Linemen can do some damage, especially against low Strength or lightly armoured opponents. I’d make sure at least one of them is putting the boot in on a downed opponent on a turn as the loss of one won’t really hurt you all that much and the potential to take an opposing team member out of the game or impact them in a league can be more beneficial in the long run. Throwers are the last of the team players I will talk about as we’ve not used Goblins nor Trolls as of yet. To be honest, in the two games so far they haven’t really done a lot. On receiving a kick off they can be quite useful as you can grab the ball and then move into a decent position to hopefully get the ball to one of your Blitzers who can charge through the line of your opponent and make a run for the end zone. There are two in the starting teams but I’d be tempted to drop this to one. Generally he’s not going to be holding the ball for that long so if your defence is solid he shouldn’t be taking too many hits. If he doesn’t have the ball then there is no sense blitzing or blocking him as you want to position your own players to receive the football in the half of the field likely to include the thrower. The Pass skill is really what you are paying for here as that re-roll is going to be useful for helping your average AG Blitzers to make the catch (and also saving the team re-roll to make sure you do catch it!). So, there you have it, a brief rundown about how I feel about the Orc lineup. I’m not a Blood Bowl expert but these are my thoughts after running with them and seeing what they can do.